Once upon a time, web blackjack software was all about single-deck games with a double down, split and blackjack. Over time, advances in software meant that extra features started to be included like Surrender bets and side bet action. Today, CA players can enjoy a bewildering array of versions where the features offered are limited only by the imagination of the software developers. So, think about Blackjack Switch, where cards can be swapped mid-hand, or Atlantic City where spectators can join in the action without having to be sat at the table. And Live Dealer blackjack allows real-cash players to play against a human croupier via their webcam placing real bets on a real table. Regardless of the variant, or the major developer behind it, every online blackjack game features common betting options. How easy is it to drag and drop chips into the betting positions? Good software developers will make their betting spots easy to see and the action buttons will be accessible and identifiable from one another. Do you believe in patterns? Are you counting cards? If the answer to either of those is yes, you'll want to know what hands were dealt most recently. Some software will display on the game-screen the last 10 hands the dealer was dealt. Can you tell the difference between the 'Bet', 'Hit' and 'Stand' buttons? Is there a danger that you'll click the wrong button by mistake? Good Internet blackjack software developers will have their buttons prominently displayed in the centre of the screen so players make no mistake. While some blackjack games look great, sound great, and are slicker than a pretty slick oilfield, it's important to know that the games are safe. All online blackjack goes through rigorous tests before it's allowed to hit the lobby of a real-money Canadian Internet casino. Blackjack software developers receive gaming licenses from approved jurisdictions before they launch games, and games will be independently audited by approved testing labs before players can wager their hard-earned loonies. There are nearly as many blackjack software developers as there are games. Most have developed a range of familiar blackjack games like Classic and European, but others have gone it alone to produce their own exciting variants. Here's a look at some of the biggest Internet blackjack software manufacturers around today. Microgaming: The leading software developer has been producing online casino games and slots since the mid-1990s. Blackjack variants pack the lobbies of the top casinos via Microgaming's 'Quickfire' platform and Canadian players can enjoy great graphics and gameplay across all the developer's titles. Playtech - One of the world's biggest public gaming firms, Playtech's attention to detail and amazing animation and graphics means you're well-served with its variants. Blackjack Switch, which allows players the chance to swap cards in their hands, is a good example of Playtech's innovative games. Main Games: 21 Duel Blackjack, Progressive Blackjack, Blackjack Switch. Cryptologic: The Canadian firm was snapped up by a bigger Canadian company in the form of Amaya recently, but it's done nothing but improve what was already a decent blackjack software portfolio. Progressive Blackjack is probably the best-looking of the developer's portfolio as you see the dealer's animated hands pass cards to players on the virtual table. Evolution Gaming: The revolution in live dealer games has led some firms to outshine the competition. And when it comes to leaders in the field, Evolution is out there. Evolution's software allows real players to 'take seats' at a live table beamed onto their monitors from a casino thousands of miles away. Real cards are dealt, with barcodes on the cards picked up by the table's sensors and projects onto players' screens. The 'Bet Behind' option also allows players not able to get a seat to bet on any of the seated players' hands. The software allows side bets as well. Net Entertainment: The Scandinavian giant is perhaps better known for its 3D online slots, but it happens to have developed an impressive range of table games too. As well as Classic Blackjack and a slick Live Dealer variant, Net Entertainment has also developed a high roller version called Black Jack Professional with a need to master some blackjack strategy. What is the best blackjack software? Playtech, NetEnt, and Microgaming continue to be the leaders in gambling software and offer many extraordinary varieties of online blackjack. How do the game makers compare? There are so many factors that impact the development of games. While NetEnt is a leader in 3D production, Playtech seems to be ahead when it comes to offering progressives, jackpots, and other unique innovations. When looking for a place to play online blackjack you should pay close attention to the essentials: RTP% (Return to Player percentage), game variety, quality of gambling site, payout speed, and security. What are the options for mobile players? Almost all of the giant online blackjack developers offer mobile apps and no-download software for a seamless instant play alternative. 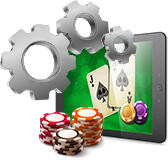 Additionally, there are also some casinos online that offer up live dealer variants to smartphone and tablet users. In short, yes. All of the best online software companies rely upon independent evaluators and RNGs (Random Number Generators) to ensure that their software is fair and square. Here at OnlineBlackjack.ca, you'll only ever find gambling sites that provide their users with the best in online safety and security. How do the random number generators work? Random number generation is done by a sequence of numbers constantly running and combining different sets and patterns of numbers over time. Relying upon mathematical formulas, these too are tested alongside the rest of an online casino to ensure fairness at all times.